Amazon's Fire Phone, rumors of which I passed along to you in mid-April, went on sale last Friday subsequent to a mid-June public unveiling. The overall reviews thus far have been somewhat lukewarm. 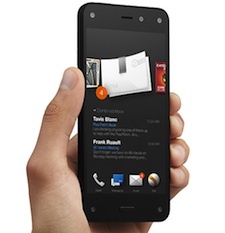 However, the Fire Phone is chock-full of vision-based features, which have held up quite well to review scrutiny. First off, there are the computational photography capabilities, for still image and video capture, enabled both by the Fire Phone's Google Android foundation and Amazon-developed enhancements (not to mention its 13 Mpixel rear and 2.1 Mpixel front cameras). Next is Firefly technology, which uses object and text recognition algorithms to identify whatever you point the handset's camera at, including (of course) items you might want to price-match and potentially buy from Amazon; television shows and movies shown on a screen in front of you; and web addresses, email addresses, and phone numbers.